If you are looking for a good quality starter guitar then you can do a lot worse than try out a Squier Stratocaster. As I have said many times my first guitar was a Squier Stratocaster and I was more than happy with it. That was well over 20 years ago and Squier has moved on a lot since then. Nowadays there is a wide range of Squier Stratocasters that you can choose from. But, in my mind, there are three main Squier Stratocaster models each pitched at a different price point which are worth a look at. There is the high end Squier Classic Vibe Stratocaster, the mid-range Affinity series and the budget Squier Bullet Stratocaster. The question is what is the budget Squier Bullet Stratocaster like and is it really worth paying the budget price for this guitar or should you save up for the slightly more expensive Affinity? Squier branded guitars are the entry level guitars designed and built by Fender. As they are Fender badged products you should be able to expect all the quality of Fender at a significantly more affordable price. With the Squier Bullet Stratocaster you are certainly getting a budget guitar. The recommended retail price for the Squier Bullet Stratocaster is £119 but you can pick it up through Gear 4 Music for an amazing £91 which we reckon is excellent value for money. But what kind of guitar do you get for that money? The Squier Bullet Stratocaster is, as the name suggests, a standard strat so has everything that you would expect from this style of guitar. The body of the Squier Bullet Stratocaster is made from Basswood which is the exotic wood of choice for budget guitars. The bolt on neck is maple with a 21 fret rosewood fingerboard. The neck is a standard Stratocaster style neck with a 9.5” radius giving a comfortable feel which is pleasing to play. The bridge is a synchronous tremolo with cast saddles allowing some gentle whammy bar action. However, if you get too energetic with the whammy bar you will very easily de-tune this guitar. In terms of electrics you have the standard three single coil pick-ups a master volume and two tone dials and the pick-ups are accessed through a five way selector switch. So far everything is as you would expect. When you plug the Squier Bullet Stratocaster into an amp and play it on a clean tone the guitar sounds good and plays well. The sound is very responsive and you can get some great blues tones from the guitar. If you crank it up a little the guitar again responds well with a nice tone and not too much background hum. If you push it a little bit further, into the high gain levels, it is at this point that the guitar starts to struggle a little bit highlighting the cheaper nature of the pick-ups. But that said it is nothing you would not expect from a similar budget level guitar. So what do I think of the Squier Bullet Stratocaster? I was surprised by the build quality of the guitar, for the money it was very good. The body and neck were well put together and the sunburst paint job looks really good. But then I am partial to a sunburst finish. The bridge is good, but don’t get too energetic with the tremolo or you will be spending quite a bit of time re-tuning your guitar. The electrics are ok, if not spectacular, but you must remember that this is a budget guitar. I suspect that with heavy use the pick-ups , volume and tone dials will start to deteriorate and will need replacement. However, by the time this happens I am sure that you will be looking into trading up to a more expensive guitar. In conclusion I think that the Squier Bullet Stratocaster is a pretty good guitar if you bear in mind the budget price. If I was desperate to get a guitar and I was on a very tight budget I would certainly look at the Squier Bullet Stratocaster. However, if you have a slightly bigger budget I suggest you would perhaps be better off looking at the Squier Affinity Stratocaster. 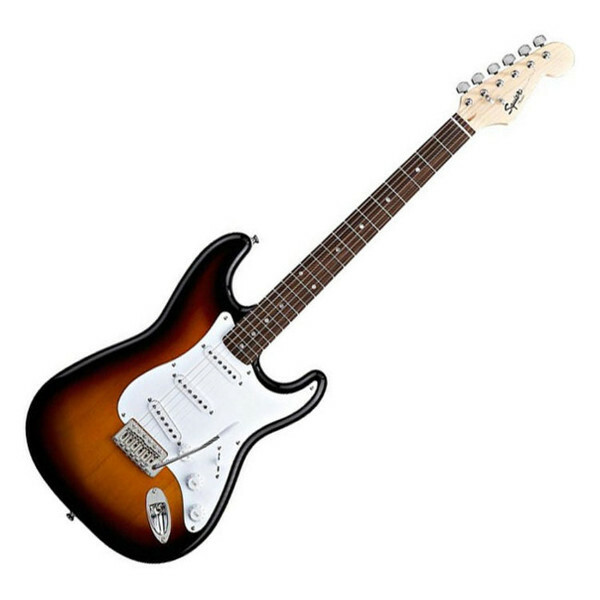 You can buy the Squier Bullet Stratocaster for an amazing £91 through Gear 4 Music.